SARANGANI, Philippines (Mindanao Examiner / Apr. 10, 2008) – An ancient burial cave was discovered in the Philippine island of Mindanao, south of Manila, and officials have sealed the site to prevent looting of artifacts, many of them jars made from clay. 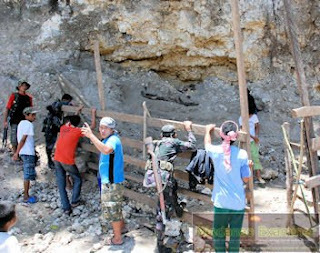 It was not immediately known whether there are other treasures in the cave which was accidentally discovered by quarry diggers on Wednesday in Maitum town in Sarangani province. The latest discovery in the village of Pinol was near another ancient burial site discovered in 1991 where burial jars, shaped in different human forms, had been recovered inside Ayub cave. Lingling Jabel, owner of the quarry site, informed local authorities about the find and the site was immediately sealed and security forces are guarding the cave where several burial jars have been recovered. “The quarry site is more or less half a kilometer away from Ayub Cave. The archaeological find at Ayub Cave consisted of anthropomorphic burial jars that date back nearly 2000 years ago. The anthropomorphic potteries of human figures depicting various facial expressions are associated to the Metal Age in the Philippines,” the local government said in a statement. “I feel happy that we have found another valuable artifacts that would help us understand more our history as a people not only in the Philippines, but probably in the whole Southeast Asia," the mayor of Maitum, Elsie Perrett, said. Dr. Eusebio Dizon, curator of the Archaeology Division and chief of the Underwater Archaeology Section of the National Museum, has described Ayub Cave as "the most significant cave in Mindanao" and its finds as "unparalleled in Southeast Asia." A team of experts from the National Museum are expected to arrive in the town to inspect the new cave. The site had been dated to 830 +/-60 B.P. (calibrated date of A.D. 70 to 370) and 1920 +/- 50 B.P. (calibrated date of 5 B.C. to A.D. 225). The radiocarbon dates were obtained from the soot samples taken from the small earthenware vessel found inside one of the anthropomorphic burial jar. The jars are unique and they are like portraits of distinct individuals, of specific dead persons whose remains they guard, described the burial jars in a book entitled “Faces from Maitum,” written by Dizon himself after the 1991 discovery of the Ayub cave. 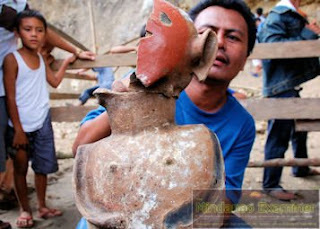 The provincial government described the cave as a unique and fascinating assemblage of archeological find - human faces and figures in earthenware - that depicts Sarangani’s cultural wealth. It said the recovered potteries were used as secondary burial jars. Its coverings were molded as human heads emulating different facial expressions of happiness, contentment, and even a trace of desolation. “Such were shaped artistically tracing the most conservative detail of the human face that can still be seen in the broken fragments of the jars outside the cave... retaining their natural color even up to now,” it said.